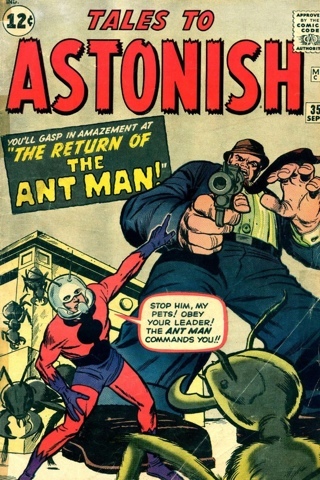 It took eight months after Henry Pym’s first appearance in Tales to Astonish #27 for him to return, and from then on he remained an enduring character in the Marvel Universe (at least until the 80’s when Bob Hall drew him striking his wife across the face in Avengers #213). People probably reacted the same way I did after reading that debut issue: “it’s such a great story, but that’s it?” As with many other Marvel creations in that era, there WAS a great concept hiding beneath the surface, but it was going to need some fine tuning before it could become anything special. 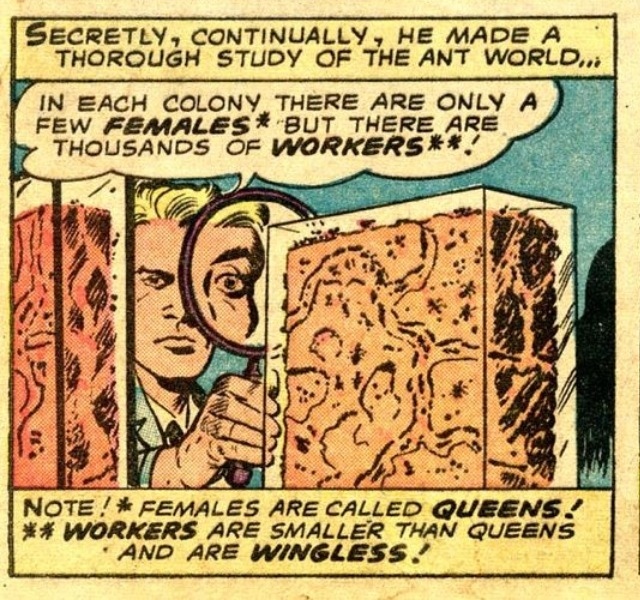 OK, Henry Pym was going to need a LOT of fine tuning. I’m not exactly sure who decided to turn Henry into a full-fledged superhero. Perhaps they were on a roll with the Fantastic Four and Thor stories that they just wanted to create another one? I mention this only because the first story was more of an Amazing Stories/Twilight Zone/Land of the Lost type story, and now seeing Henry’s next experience in a full fledged hero outfit is a little jarring. Because SOMETHING had to happen to get him to undo the idiotic disposal of the serum. The story begins with a brief recap of the first story. It ends by telling us that while Henry may have destroyed the serum, that was only the first batch. After having nearly avoided being devoured by a colony of giant ants, you would think that he would never want to see an ant again. Sadly, quite the opposite happens, and he becomes completely obsessed with ants. Forget National Geographic Mom, I’ve got a Marvel comic! 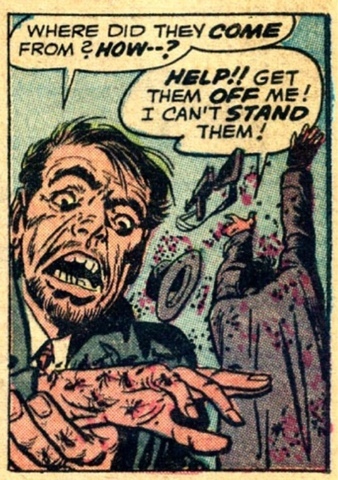 I still hate how these early comics have to try and explain EVERYTHING in the least creative way you could imagine. Not only does he want to be like them, he wants to talk to them. On a chance that he’s figured out how to do this, he actually creates a helmet (somewhat shaped like the head of an ant) that should do the trick – according to his calculations. Those Commies you love to hate are BACK AGAIN! 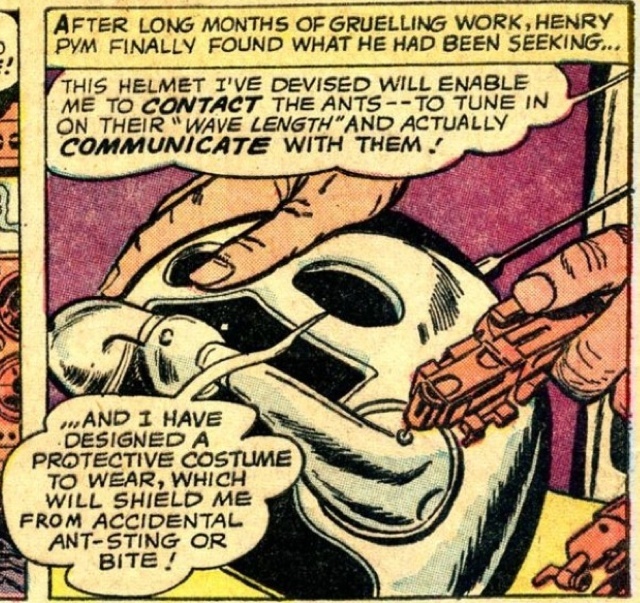 Henry and the development of his Ant Man persona is the real story here, even though we get yet another group of Communist thugs who are trying to steal some anti-radiation formula he’s working on. It’s really here that we get his true “let’s test out my new powers” story. As a kid I always loved seeing these types of diagrams. It seems like a cop-out to explain things this way, but it always made everything feel more real to me. There are great moments with him shrinking and believing that talking with ants will be easy. Nope, and they almost eat him again (damn those hungry ants!) Henry even gets to fight against a beetle. 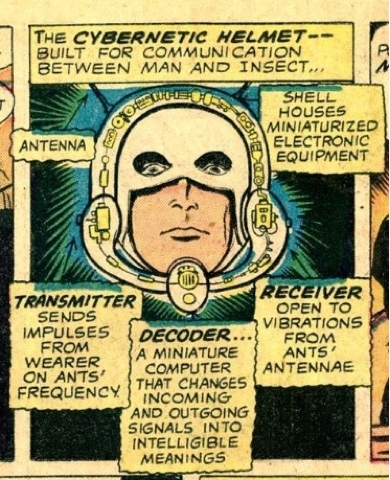 Seeing Ant Man and his costume today might seem a little goofy, but in hindsight, it’s a very unique design which I can confidently say is my favorite Marvel character design thus far. This, on the other hand, is something I hate seeing in the middle of a page. Ant Man: should I love you, hate you, or fear you? 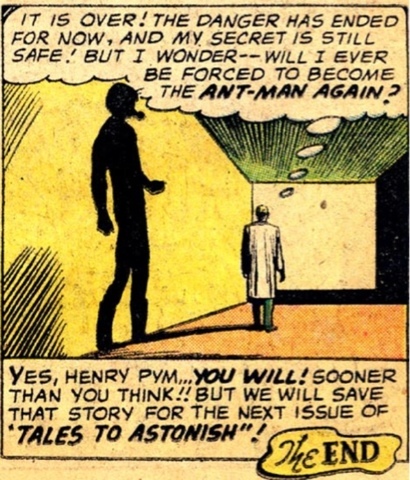 The end of this tale shows Henry asking if he will “be forced” to become Ant Man again. I hardly feel like he was forced. He created the Ant Man costume, not to find a way to save people, but out of an obsession with insects. He just happened to get mixed up with all of the do-good superhero stuff. 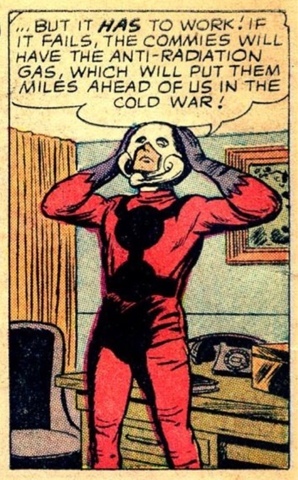 Even if the Communists decide to never show their faces again, I still imagine Henry will be moonlighting as Ant Man. After all, the story goes to great lengths to show that he doesn’t have any REAL friends, and that he wants to spend his time talking with freaking ants.